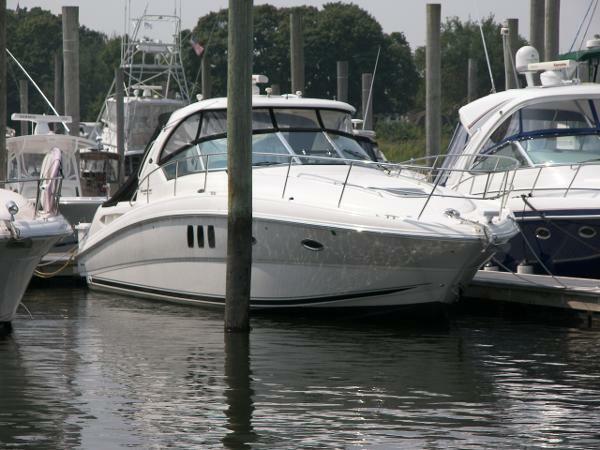 2005 Sea Ray 390 Sundancer . 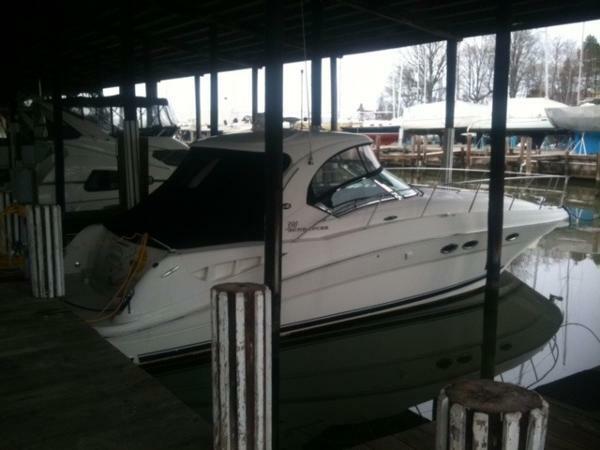 2005 Sea Ray 390 Sundancer !! LOTS OF UPDATES - GREAT CONDITION ! 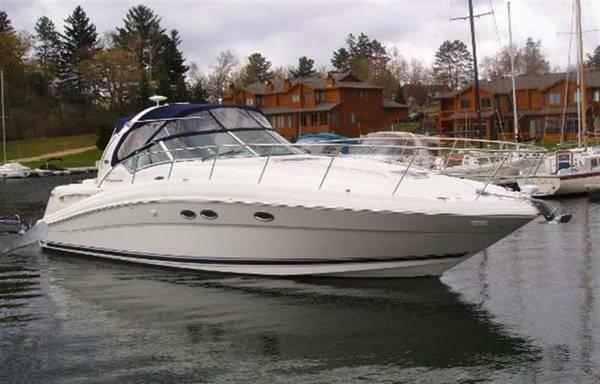 !This 2005 Sea Ray 390 Sundancer is the the only 390 currently available in the Midwest! Over the last few years it's received a good number of updates and is now turnkey ready for it's new owners! Don't miss out on this great buying opportunity as the owners are ready to move up! !Features & Updates Include:Mercury 8.1S Horizons w/ 5kW Kohler Gen in SoundshieldNEW Raymarine 12" Hybrid Touch MFD w/ RadarRaymarine C-120 MFD Intellian Sat TV w/ Cockpit Flat Panel TVNEW Cockpit IcemakerNEW Cockpit CarpetNEW Upgraded EZ2CY Forward EnclosureNEW Bottom Paint & Zincs - 8/15NEW Cutlass Bearings - 8/15Refinished Salon Wood Table - 8/15 Don't miss out on this great buying opportunity. Call TODAY for more information or to arrange a showing!!!! ALL TRADES WILL BE CONSIDERED !!! 2004 Sea Ray 390 Sundancer This Sea Ray 390 Sundancer offers considerably more features than other boats in it's class. The lavish interior of the 390 'dancer is a blend of high-gloss cherry wood cabinetry and ultra leather upholstery. Full galley. 2burner stove. microwave. separate refrigerator and freezer. Sliding door to a separate master stateroom. Separate shower and vacuflush head. Central Vac. 2 separate reverse cycle ac/heat units. Seatel tracvision satelite tv. The cockpit area is incredibly well laid out and very spacious for entertaining at it's best with it's own wetbar/sink and refigerator. 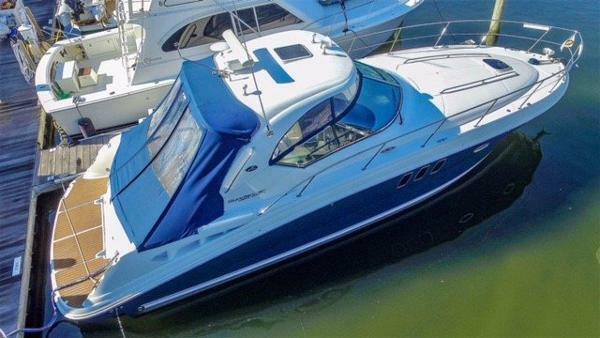 This impressive boat features a full fiberglass hardtop and the beatiful sea ray blue hull. New camper style canvas in 2016. This boat is powered by twin MercCruiser 8.1L horizons(v-drives). 7.3Kw Kohler genset with an impecably clean engine room. Windlass anchor, remote spotlight. 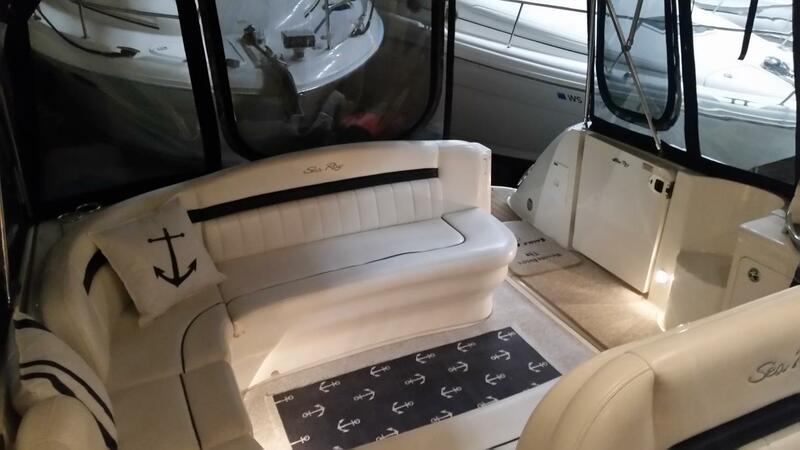 This boat is always meticulously maintained and stored indoors in the winter. 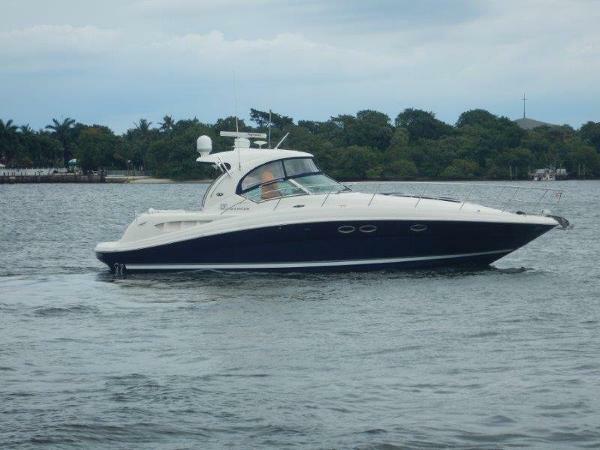 2005 Sea Ray 390 Sundancer We are pleased to offer this stunning 2005 Sea Ray 390 Sundancer, designed to get notice. The 390 Sundancer features elegance at every turn. A sleek, low-profile helm plus glove-soft cockpit seating makes this member of the Sundancer family an ideal place to spend a weekend of fun. Below the gorgeously appointed salon includes a fully equipped entertainment center, beautiful wood crafted galley and separate conversation area that converts to a bed for overnight guest. Call today to make an appointment to see this beauty in Tolchester, MD before it is to late. 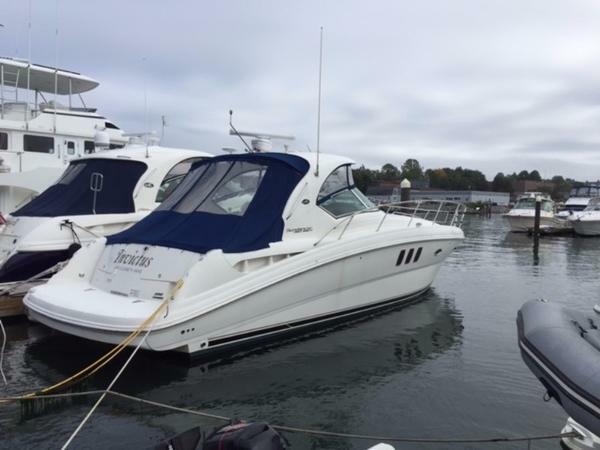 2005 Sea Ray 390 Sundancer ****** 1/4 Shared Ownership / Partnership ******FRESH WATER BOAT Designed to get noticed, the 390 Sundancer features elegance at every turn. 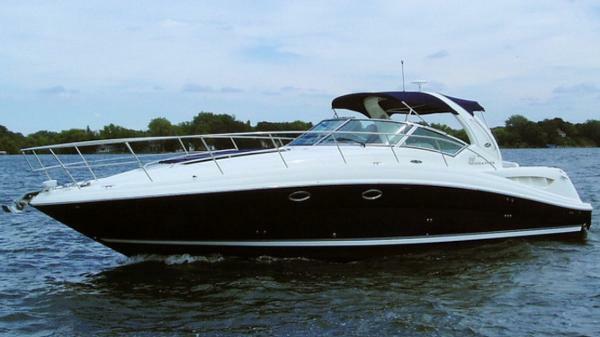 A sleek, low-profile helm makes this member of the Sundancer family an ideal place to spend a weekend of fun. Below, the gorgeously appointed salon includes a fully equipped entertainment center, beautiful wood crafted galley and separate conversation area that converts to a bed for overnight guests. 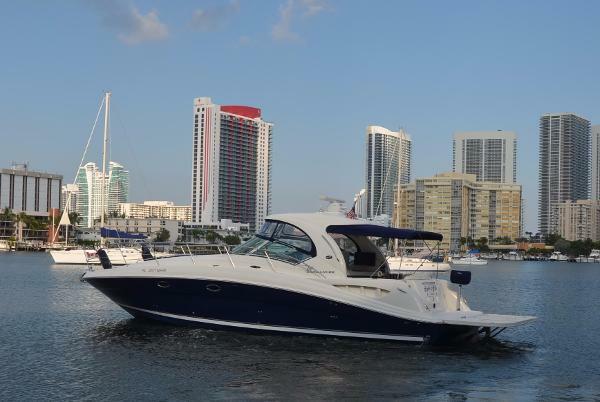 2004 Sea Ray 390 Sundancer Designed to get noticed, the 390Sundancer features elegance at every turn. A sleek, low-profile helm plus glove-soft cockpit seating makes the 390 an ideal place to spend a weekend of fun. The entire cockpit sole can be raised on hydraulic rams for engine access. The boat features a mid-cabin interior, with separate shower and head compartments, a private forward stateroom, a midships sleeping area aft of the salon, and a huge galley (with separate refrigerator & freezer) to port. There is ample seating and room to entertain in the cockpit, with a cockpit refrigerator and sink. Electronics include a Raymarine Pathfinder RL80C open array radar/chartplotter/sounder, Raymarine RN300 GPS, and Smart Craft Vessel View Of course the boat is also equipped with reverse-cycle A/C & heat. To power all this there is a 7.3KW Kohler genset. 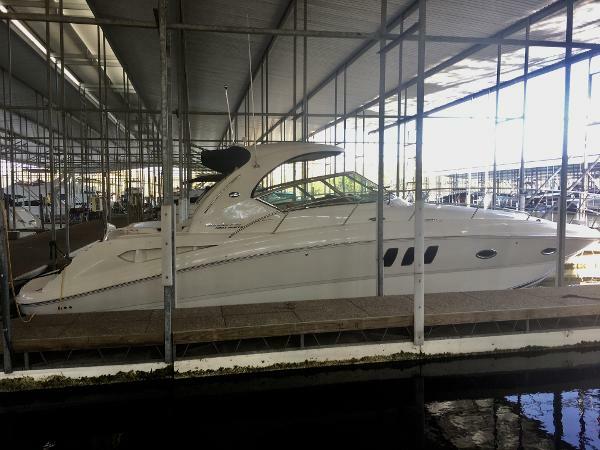 2010 Sea Ray 390 Sundancer LOOK NO FURTHER!!! This Vessel is like NEW!!! She is Meant 2 B! 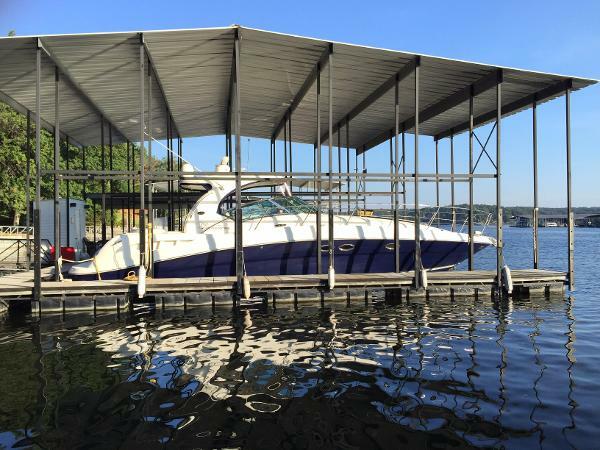 2010 Sea Ray 390 Sundancer - Like New! Under 100 Freshwater Hours!! on twin Mercruiser 8.2 H.O. 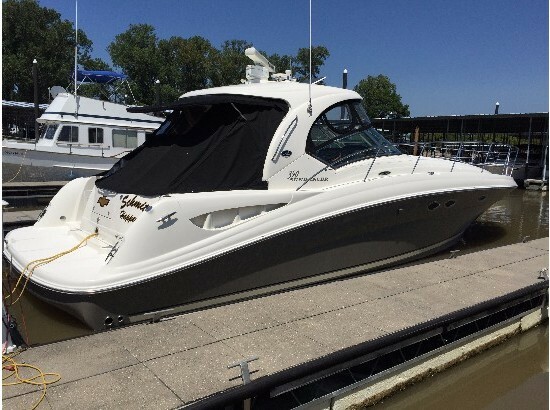 's w/emission control Current hours: 56.7 Port 57.3 Starbird This 2010 Sea Ray is in excellent condition with under 100 hours She is equipped with twin 8.2 Mercruiser H.O. 's w/emission control Kohler generator Full camper enclosure on the cockpit with Sat TV. Hard top with LED lighting and overhead hatch. Bow Thruster Cherry hardwoods and solid surface countertops throughout. Sleeps up to 6 with private master forward and convertible dinette and sofa. Very large separate stall shower in master. Hidden TV in Salon with remote to reveal Cockpit Flatscreen TV Master Flatscreen TV MidCabin Flatscreen TV Cockpit Air Large stand alone Fridge stand alone Freezer Additional Fridge + Sink in cockpit An innovative center door in the transom provides easy access to the luxuriously appointed cockpit, complete with Corian Table Top, wet bar and cockpit refrigerator. Separate shower stall is great - no wet head to clean up. The forward stateroom pocket door gives privacy not commonly found on smaller models! This exciting 390 Sundancer features a stylish fiberglass hardtop with aft sunshade, overhead lighting and stainless steel grab rails. 2005 Sea Ray 390 Sundancer As one of the most popular Sea Rays, the 390 has always made a lasting impression with its sleek lines and European styling. "Appreciation" is a great example of a well maintained 390 Dancer. She has a very spacious feel with a large salon, a large dinette across from galley which converts to a sleeper as well as a private master and an aft lounge area which converts to a private stateroom providing ample room for cruising and entertaining. Powered by reliable Mercruiser 8.1 with 370hp each the 390 can reach top speeds of around 30 knots. 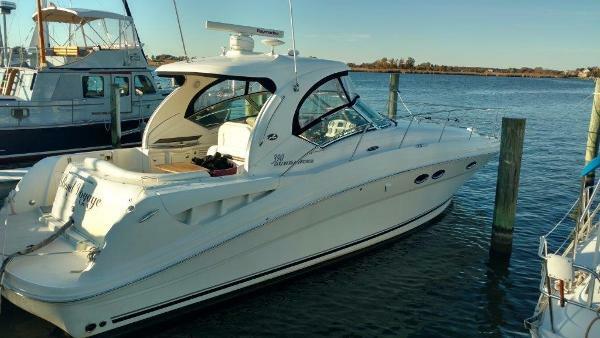 Don't miss out on this well-priced prime condition Sea Ray sure to please! 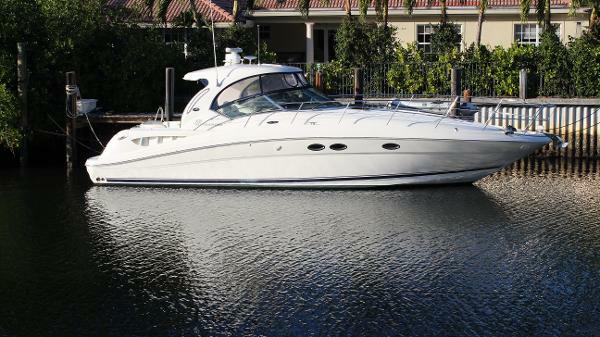 2005 Sea Ray 390 Sundancer Weber Yachts is pleased to bring you this stunning 2005 Sea Ray 390 Sundancer. Her owner has taken immaculate care of this yacht. Her blue hull, neutral colors, low hours, all lend to one final conclusion; This boat is a gem. The pictures really do show you how well she has been taken care of. Located on a freshwater lake in Minnesota, she was purchased new by the current owner and has always been under cover and has avoided the elements. This will not be one to be overlooked. 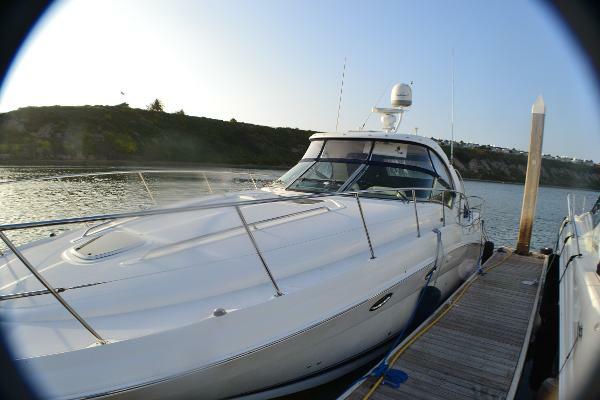 Please note this Sea Ray has the upgraded 420 HP engines.